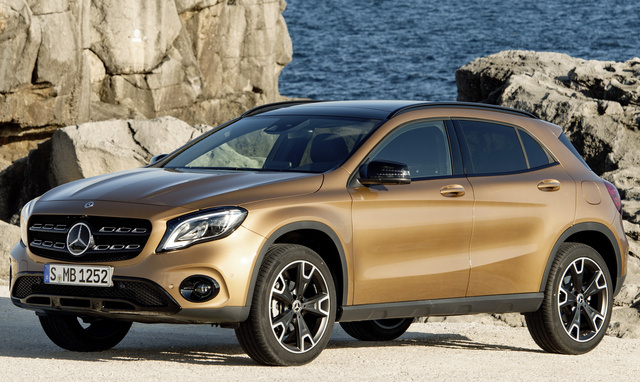 CarGurus has 389 nationwide Mercedes-Benz GLA-Class dealers with 14,345 new car listings. Luxury crossovers like the 2019 Mercedes-Benz GLA-Class offer performance with the added benefit of cargo space and optional all-wheel drive (AWD). The GLA-Class competes with the likes of the BMW X1, Audi Q3, Volvo XC40, Lexus UX, Cadillac XT4, and Jaguar E-Pace. It also exists in the same market segment as the Infiniti QX30, its sister vehicle. There are two trims of the GLA-Class, the GLA 250 and the AMG GLA 45. While all-wheel drive is optional for the GLA 250, it comes standard on the AMG GLA 45. Under the hood, the GLA 250 comes equipped with a 2.0-liter turbocharged 4-cylinder engine. It makes 208 horsepower and 258 pound-feet of torque and sends power through a 7-speed automatic transmission to the front wheels or available 4MATIC AWD. Fuel economy for the GLA 250 is 24 mpg city, 33 highway, 27 combined. The GLA 250 4MATIC returns fuel economy of 23 mpg city, 31 highway, 26 combined. The GLA 250 features 18-inch wheels, 14-way power-adjustable front seats, a power liftgate, Bluetooth connectivity, dual-zone climate control, leatherette upholstery, and a 4.5-inch digital display. The GLA-Class features 17.2 cubic feet of cargo space behind the rear seats, which opens up to 43.6 cubic feet with the rear seats folded. Available packages for the GLA 250 include the AMG Line exterior, which adds 19-inch AMG wheels, painted brake calipers with upgraded brake discs, and black interior headliner. The Premium Package adds heated front seats, blind-spot monitoring, keyless entry, push-button start, and SiriusXM satellite radio. An available Multimedia Package adds navigation, advanced voice control, Apple CarPlay, and Android Auto. The Mercedes-AMG GLA 45 also features a turbocharged 2.0-liter 4-cylinder engine, but this one puts out 375 horsepower and 350 pound-feet of torque and pairs with an AMG-tuned automatic transmission with paddle shifters. This combination is good for a 0-60 mph time of 4.3 seconds. The AMG GLA 45 returns 22 mpg city, 28 highway, 25 combined. The AMG GLA 45 has more aggressive body styling, an added rear spoiler, and unique 19-inch AMG wheels. Inside, the AMG has a racy cockpit along with sport seating. It also features different drive modes, including Comfort, Sport, Sport+, and Race. 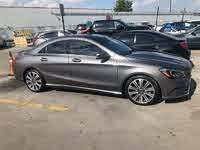 Available options include AMG Ride Control with two-stage damping and an AMG limited-slip front differential. You can also enhance it with the AMG Aerodynamics Package, which adds a larger gloss black rear wing and front aero splitter with additional canards. The GLA comes standard with a reversing camera, a driver-drowsiness monitor, forward-collision warning, and automatic emergency braking. There are a couple of options packages that add various driver-assistance features. The Driver Assistance Package adds adaptive cruise control and lane-keeping assist. The Parking Assistance Package adds a 360-degree monitor, auto-dimming mirrors, and power-folding side mirrors. It also adds the Active Parking Assist self-parking system. With the GLA-Class, you can get luxury without giving up performance. What's your take on the 2019 Mercedes-Benz GLA-Class? Have you driven a 2019 Mercedes-Benz GLA-Class? CarGurus has 8,496 nationwide GLA-Class listings starting at $15,495.